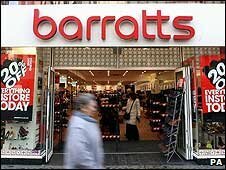 High Street shoe shop chains Barratts and PriceLess have gone into administration, it has been announced. The two chains consist of 400 stores nationwide, employing a total workforce of 5,450 people. Administrators from Deloitte said the shops had not been closed and were continuing to trade as normal. Barratts and PriceLess are owned by a Bradford-based firm, Stylo. The parent company is not in administration, but its shares have been suspended. Deloitte said it was seeking to place the companies into a Company Voluntary Arrangement (CVA), in which people who are owed money by a firm can vote on a repayment proposal put forward by its directors. If the proposal is approved by 75% of creditors, the company can emerge from administration and pay what it owes within an agreed period of time. Stylo said it did not anticipate any short-term improvement in trading conditions, which it said had "deteriorated markedly". "Against this background, the board has concluded that current and projected sales cannot support the current cost base of the business, in particular the high rent obligations," Stylo's statement said. "Therefore a more pro-active restructuring approach is required to return the business to profitability." Stylo said it wanted to repay all creditors in full and reach a new agreement with landlords. It added that it had support from the Prudential, Lloyds Group and Barclays for the restructuring process.